An effort has been underway for several years to be able to deliver a line of high-quality display cases for use with the models that I have produced, something better than folded acrylic or fabricated glass covers on generic wooden bases. Shown above and at the left is the beginnings of the first sample of what I hope you will find to be a suitable resting place for your Kohs & Company model when not in use on your rails. The glass cover was built using the same techniques required for the finest stained glass windows and shades. The glass itself is museum grade and as clear as is available anywhere. 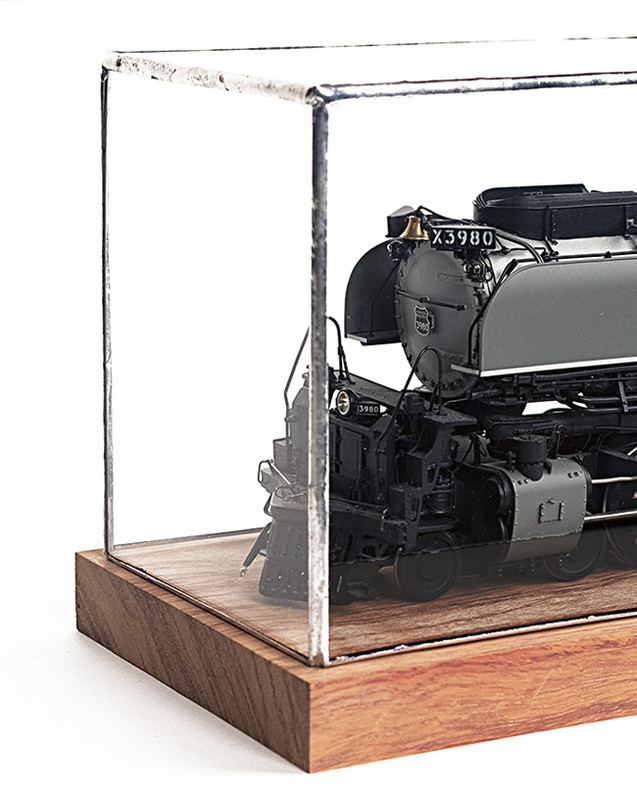 The leaded (soldered) raw edge beading shown provides a classic industrial appearance seemingly very appropriate for displaying railroad locomotive models. For a more formal presentation, the beading can be petinaed in a variety of tones from brass and dark bronze to black. The bottom edge of the cover will be mortised into the base which can be milled from a selection of classic hardwoods. The locomotive can be positioned on ballasted trackwork or for a more formal appearance, on rails mortised into the base for a very clean museum presentation. A variety of sizes will be offered as well as custom sizes.